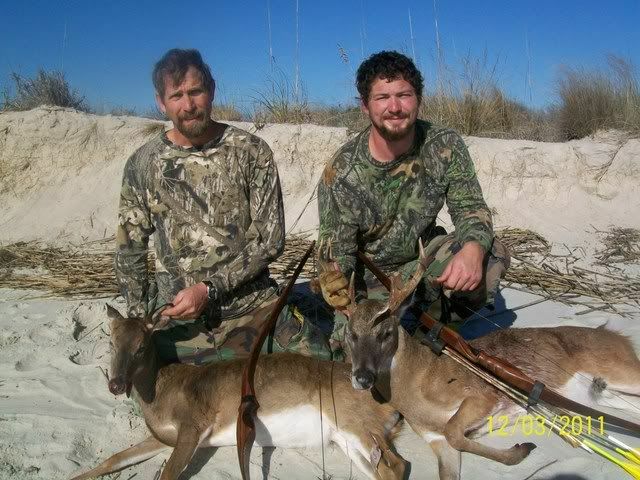 i shot the buck and my uncle shot the doe. we were hunting over 150yards apart but our deer died within 40yards of one another. full story over on the pow wow. You two guys bring you beach balls bathing suits? It does not look like you are very far from the water! Very cool, going to read the thread. Great Job that is an awesome double. Congrats! That is too cool. Very nice, Eric! I use to love hunting out there till it got more trouble than it was worth. If you've never been in the woods at daylight, and seen the world come alive, you haven't " Lived". Bisch, the water at high tide was about 5 yards behind our cameraman. it is a very neat place to hunt. the only place i have ever hunted that i could almost not hear the deer coming for the crashing on the beach behind me. Congrats to you both!!! Cool beach pic. Pretty unique setting for hunting...but amazing to see the results, congrats!